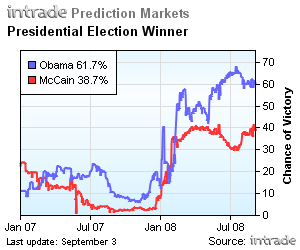 Ever wondered why the candidates' poll numbers are close relative to those in the betting markets? The analogy of financial results versus outlook is probably helpful. 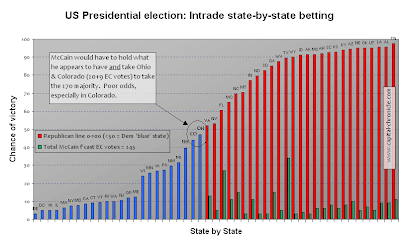 Bar monumental gaffes by the Democrats - and assuming Intrade proves as predictive as they did last time – a lot of middle-aged, blue-collar white fellas in the key mid-west / north-east states are about to paint the White House…blue.